SHOR IN THE CITY is a juxtaposition of random sound and visuals of Mumbai during the sonorous Ganesh Festival,enlivened with frothy humourous dialogues, lively city-bred characters and some drama.The film mostly works in its humour bits. The drama is a little steely, with people getting away with murder umpteen times, without any police intervention.Thankfully, the director duo (US based, of Indian origin), do not take things too seriously and spin a fun yarn of three bumbling goons,a NRI, a budding cricketer, a newly-wed couple and a girl flooded with marriage proposals. Tilak (Tushar Kapoor, adequate), Mandook (Pitobash Tripathy, standout) and Ramesh (Nikhil Dwivedi, good) steal a bestselling author's manuscript, Tilak plans to publish the same to boost his pirated book business. Abhay (Sendhil Ramamurthy, cast suitably), back in India to start a new business, is hounded by local goons for 'protection' money. Sawan (Sudeep Krishnan, fits the part), is a struggling cricketer hoping to make it to the Mumbai under-22 team. The central idea, how the city's arrested, shunted spaces, the booming human population, the resultant noise, affects the way people act, is reflected vibrantly on the characters. A Lord Ganesh idol strapped to a car seat, couples kissing at Marine Drive in broad daylight, are couple of eye-catching vignettes. The familiar Mumbai lingo finds its crazy outlet in Mandook's loafing character, and this is where we find the most engaging scenes. The female strands are as unconventional as they come, though it is never clear how Tilak's wife (Radhika Apte, arresting) ends up in wedlock. Yet, there is a bitter-sweet humour in how a young girl (Girija Oak) complains about her dry lips and later of a forcefully extracted ring. 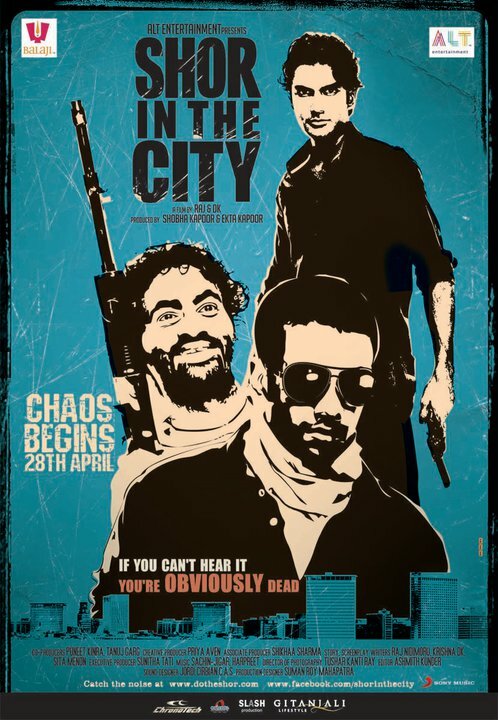 There are not many complaints, as the directors seem to have achieved what they set out to achieve - an entertaining, irreverent tale of Mumbai, with both real and comic book style interpretations gelling in to the narration. Go for it, best watched on 70mm. A 'professional' protester douses himself in kerosene and rants a mock-sacrifice monologue, then goes stiff in horror when a lighter flame is held before him.